My Red Cabbage Salad with Walnuts and Raisins is one of my good old reliable Weight Watchers Salad Recipes that I’ve relied on for whenever I need a pretty and tasty salad in just a few minutes. You get the crunch of the fresh cabbage combined with the sweet, chewy raisins, salty blue cheese, and the nutty walnuts, all just exploding with deliciousness in each bite. This salad also offers a great way to get in some heart healthy fats from the incredibly good for you walnuts. And it goes great paired with variety of meals. I’ll often add some chicken, hardboiled egg whites, and a slice of crumbled bacon if I want to bulk it up and have it as an entree salad. But it’s really versatile and works well with a variety of main courses. 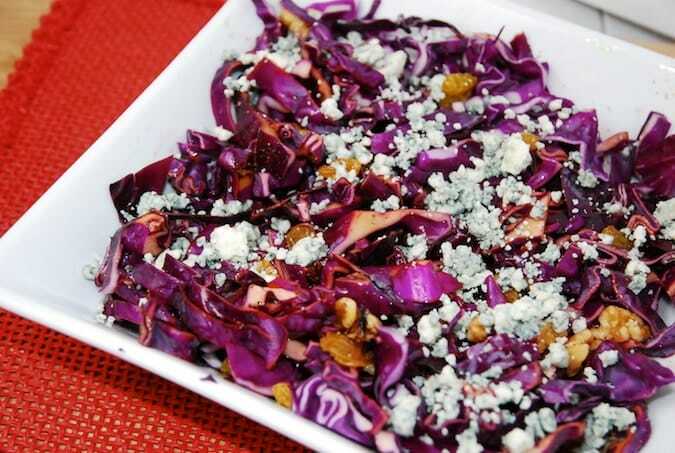 I highly recommend giving this cabbage salad a try! Fresh, crunchy, and deliciously satisfying, I love the simplicity yet boldness of this cabbage salad. It can be prepared quickly, but tastes flavorful and gourmet, and is low on Weight Watchers Points, but packs in lots of nutrients. In a small bowl, whisk together the oil, sugar and vinegar. In a large bowl, combine cabbage, walnuts and raisins. Toss with dressing, season with salt as desired, and top with blue cheese crumbles. This recipe is tagged as “vegan” but there is cheese in there. Did you mean to tag this as “vegetarian” instead?